So Sunday marked my annual trip to the hairdressers. I’m sure I’ve mentioned before the fact that I’ve avoided hairdressers at all costs during the last 5 years or so, due to this one time a hairdresser cut my barnett like a freakin’ massive mushroom. To disguise my split ends and uneven self cut trims I’ve resorted to hair extensions for the past 2 years, which hasn’t been too bad as they do make me feel really sassy on a daily basis. However, the daily upkeep and the fact it takes over an hour to dry it with my extensions in is becoming rather tiresome. Especially when I’ve started to even cop out on social plans in favour of that classic excuse ‘I’m washing my hair’…. When I was invited to Toni and Guy in Newcastle Under Lyme to give the brand new Olaplex product a go, I did have my initial apprehensions. Could this be the product to make my orange version of the Hipster Bride hair cut dream come true in one sitting? Will I come out looking like a mushroom again? Only 4-5 hours in the salon seat could tell…. So, What Is Olaplex and How Does Olaplex Work? It’s all a bit science-y how it works, but basically Olaplex reconnects broken disulfide sulfur bonds in the hair. Olaplex is a revolutionary anti-breakage hair system, available exclusively in salons such as Toni and Guy in Newcastle Under Lyme. It dramatically reduces hair breakage by linking the broken bonds in your hair during any chemical treatment. From hair dying/bleaching to perms, Olaplex has broken the boundaries when it comes to chemically treating your hair! You can lift the colour of dark hair in one sitting, by taking the peroxide strength to the next level with Olaplex acting as your hairs ‘insurance’. It can also be used in instances where people want a perm and a colour in one salon session too – although perms are a bit 90’s I think the fact that you can now kill two birds with one stone might just help them to make a bit of a comeback soon. For use in Salons only, Olaplex No1 is the ‘Bond Multiplier’ which is added to the dye or lightener within the mixture to be applied directly to your hair. Olaplex No2 is the treatment applied once the dye has been rinsed out, on wet hair, to insure that breakage is dramatically reduced. Now this may all sound like false promises and urban myths that it is now possible to bleach/treat your hair with pretty much no additional damage…. BUT LET ME TELL YOU…. It’s no word of a lie. I’ve dyed my hair for around 15 years now, from deep blue-blacks to peroxide blondes and after stepping out of Toni and Guy this weekend I still can’t believe how healthy, shiny and bouncy my hair feels. Even using a gentle bleach to refresh my red ombre would immediately cause visible split ends. The talented colourists Tom and Steve spent over 4 hours washing, cutting, bleaching, washing, drying, colouring and curling my hair and I can honestly say it has never felt as good as it does right now. It’s almost like Olaplex has breathed a new lease of life in to it! The curls have stayed in and the overall appearance of my hair is so much smoother than before. I was too busy staring at my hair transformation in action and talking about Game of Thrones to fully take in the products used, but after applying a whopping 12% peroxide mix and dying my roots a deep cherry red, Tom and Steve then proceeded to the next stage (after that first step of hair magic was washed out and dried of course). 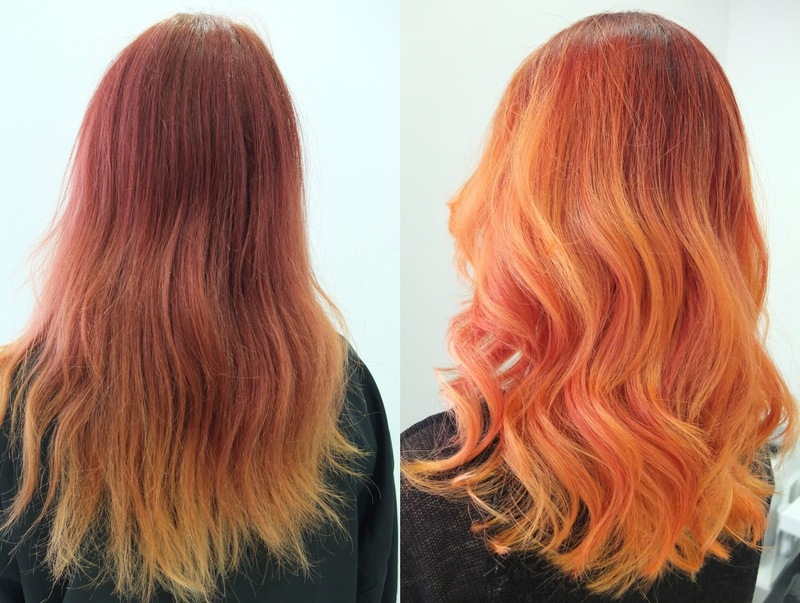 Using a range of Wella Magma colours, in the shades pictured in the first image at the top of this post, Tom then proceeded to get all Picasso on my locks by applying this range of red and orange colours free hand. As the colours have been applied to now-freshly-bleached hair it means that when they do eventually fade it should go a delightful peachy-pink mix! 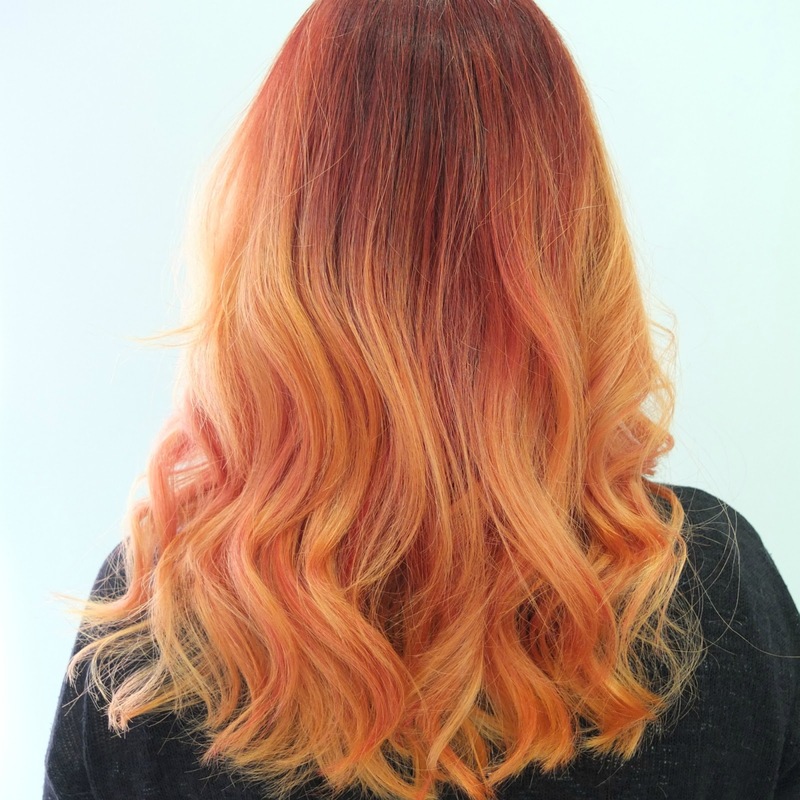 Olaplex does claim to make colours last significantly longer in the hair, as well as being praised for protecting and bonding hair strands back together, so I really can’t wait to see how long my new orange ombre hair lasts. I’m really pleased that the colours are now a much more refined range of copper and orange tones, rather than the drab in comparison red shades I’ve been home dying my hair with before. So I’m really hoping that this fresh cut and colour is finally going to wean my off my hair extensions dependency. Right now I must admit that I’m missing having them in so much (they were wefts attached with micro rings), and my hair feels and looks so much thinner to me than it actually is, but at the same time I also can’t believe how long it is at the back!! So that’s it – I’M GOING COLD TURKEY. I cannot fault the service I received in Toni and Guy (Newcastle Under Lyme), and as Steve said ‘You’re not receiving any special treatment’ so that’s reassuring to know that anyone can walk in and now get the amazing Olaplex transformation for themselves with an excellent bunch of stylists and colourists to boot. If you’re after something particularly light, such as silver hair or pastel colours, then definitely scout out your local Toni and Guy salon which offers Olaplex products. In one sitting you can literally go from dark chocolate browns to lilac hues!